Angelo of Eat Matters decided to tackle egg as an ingredient for the 17th round of Lasang Pinoy. Oh I thought about omelets right away but then, nilagang itlog has always been my favorite. Be it plain hard-boiled eggs as snack or breakfast just like what nourishes a poor Chinese laborer in construction sites here in Beijing, or toppings to a hearty chicken noodle soup. 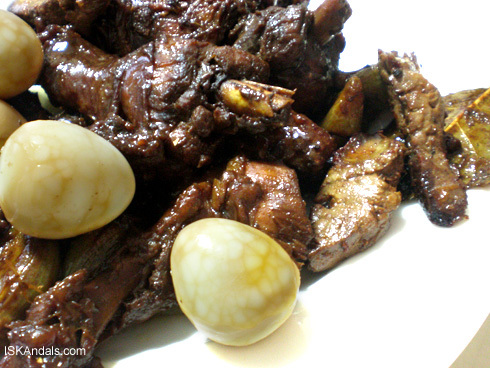 And so I present to you… chicken and marbleized quail eggs adobo. 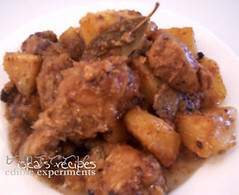 A lot of things had been said about adobo – the national dish, soul food, the non-Pinoy’s favorite Pinoy food. 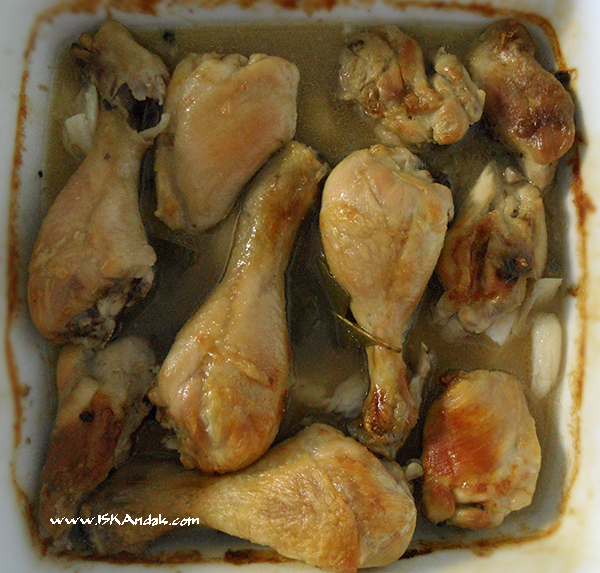 There are also so many ways to cook adobo and for quite sometime I have always wanted it soupy but nowadays… mean and dark it is, just as I remember it as a kid. The 1st time we had a drinking spree at home was my 19th birthday and that day marked the beginning of a series of inuman either with friends and relatives. My parents were always there enjoying every bit – mom drinking liters of cola while dad with just half a bottle of beer that’s consumable for the whole night.Social drinking eventually played a huge part in my kind of work for a lot of reasons. Dealing with colleagues, clients, consultants, suppliers, contractors, even laborers. Also like Ting said, drinking is a way of unwinding. It’s a person’s way of de-stressing from a hard day’s knock although now it’s been quite a while since I went into such a pinoy-style gathering and my tolerance to alcohol has diminished considerably. 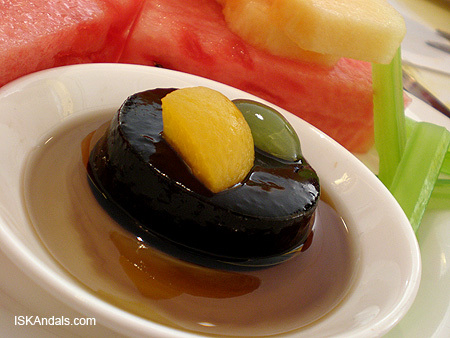 Pulutan is a kind of food that is served as accompaniment to a drink. It comes in different kinds like meat, fish, nuts, chips. It’s prepared in different ways… fried, steamed. Basically, it is anything that makes drinking enjoyable. Source: Lasang Pinoy 6 : Let’s wash it down with booze! Too bad I forgot what Dad & Mom normally prepared for pulutan. My guess, menudo or inihaw na tilapia (broiled tilapia over live charcoal). With my friends, I do remember that isaw has always been a favorite. It could be IUD (chicken intestines) from a street vendor (IUD photo is courtesy of GUTS. GRIT. GUMPTION.) 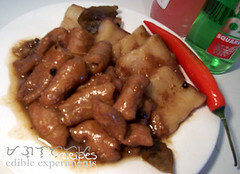 or crispy chitterlings as prepared by my friend’s mom. Here in Beijing we occasionally go to this English bar with Pinoy musicians, an equally Pinoy chef, and among our favorites are sisig (a sizzling dish of spicy chopped pork head & liver) and chicharong baboy (pork rinds). However, when it comes to pulutan it’s the other way around over here as it is alcohol that accompanies food. The Chinese traditionally drink while eating so you can imagine the scenario as it’s considered improper to say no to the host especially if he’s our Client. Gan Bei! ( Pronounced ‘gam bay’, meaning ‘dry cup’) You are expected to empty the glass. The good thing is that drinking with food decreases the rate of alcohol absorption and may also reduce the amount consumed. 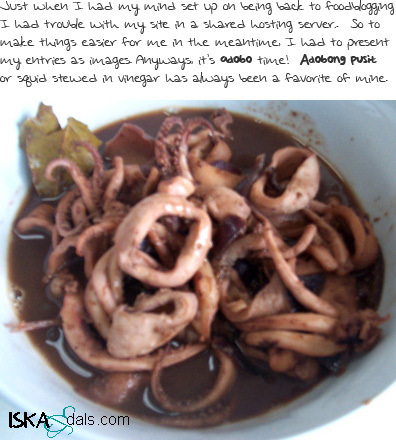 For LP6, here is the recipe of our carinderia adobong isaw ng baboy (stewed chitterlings, chit’lins or pork intestines, whatever) as I remember it from my Dad. 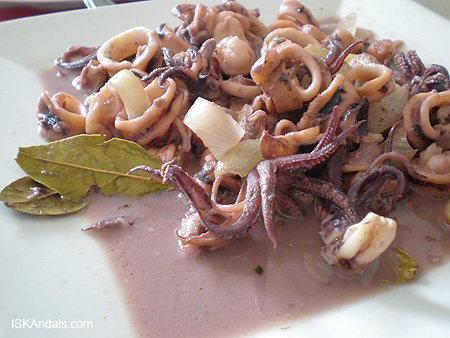 It’s not standard turo turo (eatery) food but a delicacy especially popular with the common masses served as pulutan. Oh was I glad to find that the chitlins being sold here in supermarkets are really clean. If I didn’t check it out and research a bit on the country’s national dish (which is lechon), I would certainly say that it’s adobo right away. 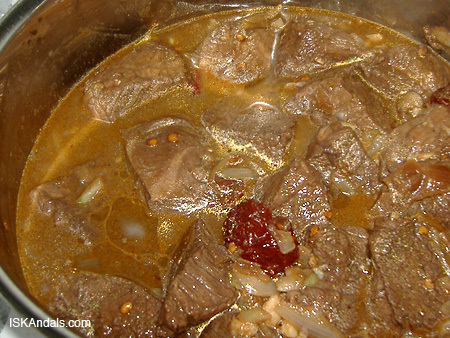 So let’s just say it is the best-known Filipino dish. What more is there to say about it? Well, I just wanna add that it was something I envy every time I had fried galunggong (or mackerel scad) for binalot and my classmate seating beside me had adobo. For a 6-7 year old kid, galunggong wasn’t something I really liked back then. Mom’s chicken adobo is dry. She lets the sauce dries up and fries the chicken w/ more soy sauce. I love it. It’s really good paired with plain rice. But what I usually prepare now is something different. 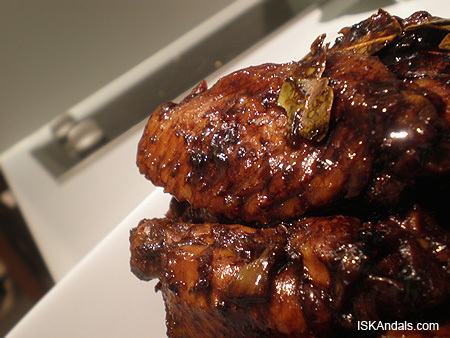 It’s a combination of mom’s adobo ala-eh style and what I encountered during my overnight stays on friends’ homes during my college days. Oh my near-bohemian archi student days. Some of my friends’ moms cook it with thick sauce and potatoes. 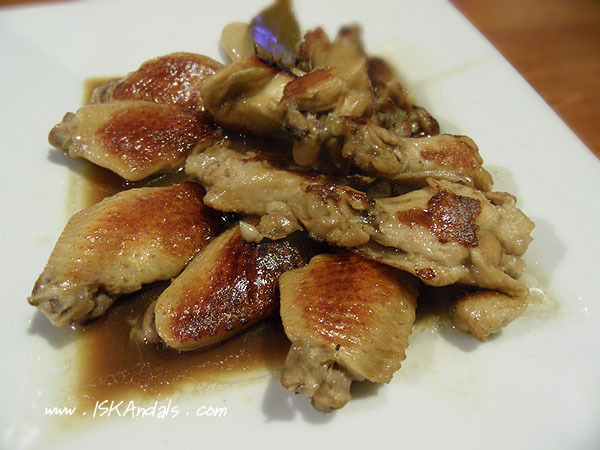 And oh by the way, 2 non-Pinoy friends of ours – a local Chinese MA student and a Singaporean Spa Owner/Consultant, love our Philippine adobo.